The great state of Texas is about to make history. Within the next year or so, total wind energy capacity on the state’s power grid will beat coal, and it won’t be a squeaker. 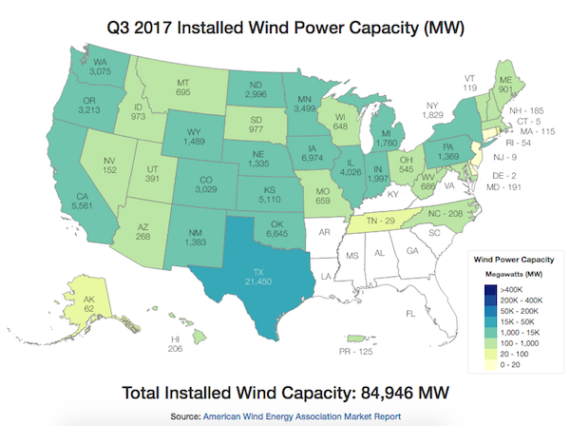 According to researchers at the University of Texas, by the end of 2018 wind will be racing ahead with 10,000 megawatts more in capacity than coal. US President* Trump made saving coal jobs a feature of his successful 2016 campaign, and US coal mining has seen an uptick in production in recent months. However, coal jobs are in steep decline on the power production side. The news out of Texas is more evidence of a long, deep, downward slide for coal jobs in this country. The surge in Texas’s wind energy sector represents a double whammy for coal. On one hand, coal has been facing ferocious competition from the shale gas boom, which is still flooding the market with a more nimble, cheaper, and cleaner-burning (though not necessarily cleaner) fuel. On the other hand, wind energy is becoming more competitive. Wind turbine costs are falling, and wind farms are being operated more efficiently. Texas also had the foresight to realize that access to wind energy would be a major stumbling block. The state’s CREZ wind transmission line was conceived and built several years ago, enabling high-population eastern parts of the state to get clean power from the wind-friendly west. As a result, wind is also set to push past coal in terms of annual electricity generation, in addition to running ahead on capacity. Not all of the anticipated power plants may be built, but if you caught that thing about only 14,400 MW (megawatts) of natural gas compared to much larger figures for wind and solar, you’re on to something. Renewable energy is beginning to edge past natural gas in some U.S. markets, and it looks like Texas is next in line. Sustained low wholesale power prices, an oversupplied renewable generation market, and low natural gas prices, along with other factors, have contributed to this decision. …and “the market’s unprecedented low power price environment” for the third closure. So much for the Clean Power Plan! The Electric Reliability Council of Texas manages the grid for almost the entire state, which requires a massive amount of long term planning, so it’s also instructive to take a look at the scenarios ERCOT uses. The expected strength of the Texas economy resulted in all other scenarios seeing moderate to strong load growth. In all eight scenarios, solar generation additions by far represented the largest resource capacity change on the system. With those retirements in mind, ERCOT is looking at a one-hour window of time in the evening, from 8:00 to 9:00 p.m., where the amount of solar generation in the grid could create complications for power supply. That would have been a dealbreaker just a few years ago, but new grid management tools are available including energy storage, wind energy, smart grid technology and demand response. The one scenario that foresees a drop in grid demand could also come into play. That’s the “High Energy Efficiency/Distributed Generation scenario,” which posits large amounts of distributed energy and “aggressive” efficiency programs. All eight scenarios foresee more coal power plant closures to come, and that’s where it gets interesting. As the University of Texas emphasizes in its new article, so far natural gas is the main driver of coal plant closings. ERCOT seems to have missed the mark on that dynamic. Back in 2015, ERCOT looked at the impact of then-President Obama’s Clean Power Plan. They anticipated a just smattering of coal plant closings directly related to the new emissions-cutting plan, and they didn’t see wind generation capacity catching up to coal until 2030. The zinger is that the Clean Power Plan never went into effect (it got hung up in court early last year), and yet wind is racing 13 years ahead of the rate anticipated by ERCOT, thanks in a large part to cheap natural gas. In other words, the 2016 ERCOT assessment is likely erring on the side of caution when it comes to emerging market forces and new technologies, and the state will experience a relatively seamless transition to a low-carbon grid sooner rather than later. Image: US installed wind capacity, US DOE via American Wind Energy Association.